The Miracle of Life Church Bang Bo was planted in June of 2006 by Bob and Debbie Scott. 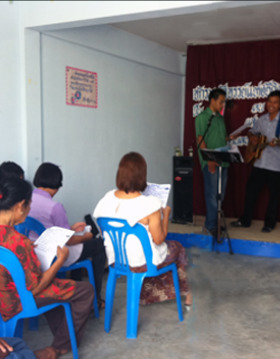 While pastoring, they have trained some of the Thai leaders in the church to minister and conduct outreaches. As a result, Miracle of Life Bang Bo has outgrown its facilities twice and is now in its third location. God has performed many miracles in the lives of the church members, and three people have even been healed of HIV. The church continues to thrive through weekly outreaches and through discipleship programs. Bang Bo is one of the strongest THP churches. Since 2006, these church believers have won over 1000 people to Christ! Many of them are involved in evangelistic outreaches and discipleship programs in the other church plants on occasion as well. Also, this church has several strong emerging leaders that are showing true promise for long-term leadership in the THP; one of the most committed of these leaders is Nam. Nam is currently being trained through our mentorship program to soon be the pastor of Bang Bo church! 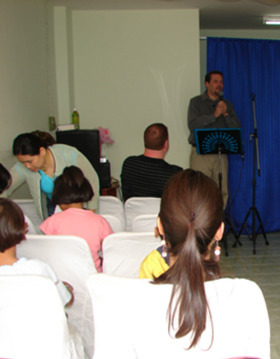 Our second church plant occurred in July of 2007. Nong Suea is predominantly a farming community and has proven to be very different from all our other churches. It has become another thriving church with over 40 believers! (The average church size in Thailand can range from 10-20 people.) The church is known in the community for having mighty miracles! They have a great rapport with the community and have seen key relationships established. There are many testimonies of people who were skeptical of the teaching, but had their hearts changed after seeing God work supernaturally in the lives of their children or relatives. Kit is the pastor of Nong Suea. He is a graduate of Amen Bible Training Center, and Rhema Bible Training center (where Bob has served as one of the instructors). Kit was previously a Buddhist monk and rejected the Christian message his brother would frequently share with him. He came to the first THP “miracle of Life” Crusade where he encountered the true living God. He has been an adamant follower of Christ ever since. He has seen the Lord heal many people in the Nong Suea area We believe that with Kit’s passion for God and for people, the church will continue to grow and expand its work. A new believer named Jamnuan Junmiwang had an accident leaving her left hand partially paralyzed where she could not use her hand or fingers to pick up anything. This accident actually caused the right side of her brain to not function correctly. Her entire left arm and hand was almost completely nonfunctional and as a result, she could only lift her left arm a little bit. A miracle happened when hands were laid on her in the name of Jesus. After Pastor Kit finished praying, Jamnuan did what she couldn’t do before. She lifted her hand well above her head! Pastor Kit gave her a Bible, which was quite big and heavy, and she was able to grab it and lift it high! She lifted it higher than her head! Jamnuan had tears of joy because of God’s love and grace. She comes to the church every week now, and she never misses. She riders her bike close to 5 miles one-way each Sunday. She also brought one of her relatives to receive salvations as well. Now, they both come to church together! They each ride their own bike, and they come early before all the other church members arrive. 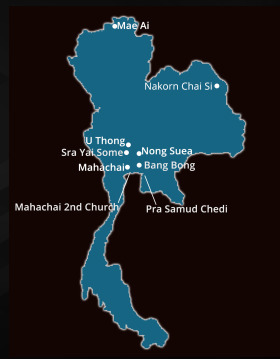 The Mahachai crusade/church plant started with a bang in March of 2008! We had nightly crowds of over 700 people and most prayed to receive Jesus as their personal Savior. Pastor jay, the THP Assistant National Director, pastors this church. The church just moved to its second location and is beginning to see some good momentum. 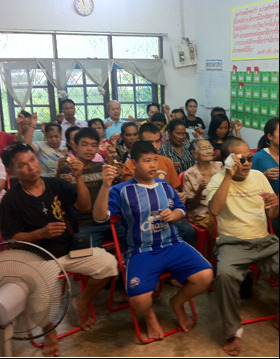 The church members of Mahachai are very dedicated and love the Lord. One of the church members, who had financial problems, took the initiative to start selling rice soup, which is a very traditional quick breakfast. She sets up every morning right in front of the church. She actually sells out every day well before the other vendors! She gives all the glory to God and promotes people working hard while trusting God for answers. She shares her faith openly and has led many to Christ. He is also someone that gives to the Lord’s work on a regular basis. There is also Mrs. Rung the wife of and influential police office. At first, she has had to sneak out of their house to attend church, since her husband forbade her to do so. After much prayer, God has changed his heart, and he now allows the family to attend. Mrs. Rung is a hungry student of the word and never misses church or Bible Study sessions unless she is out of town. We vividly remember her 4 year old daughter, just a couple of weeks after being saved, singing during praise and worship. She knew all the words of the songs by heart! Pastor Jay has the joy of pastoring some of the most committed and consistent church members in Sra Yai Some. Although this church recently went through a church split, it has doubled in size from a year ago. All of the church members have been water baptized and filled with the Holy Spirit. These members are persistent in making new converts and bringing people to church. Every week the church members participate in a cell group at one of the church members’ house. Since Thailand’s culture is very relational, cell groups create another avenue for unbelievers to join a Christian meeting where they hear the Gospel. Because of these church members’ dedication, we believe steady growth is inevitable for this church. Miracle of Life Churches originally planted by the Thailand Harvest Plan but now under different denomination(s) & leadership. *This church was forced to close after facing internal challenges which culminated in a church split and then the region being flooded during the national flood of 2011. Future considerations for a re-launch at some point are a possibility.